Image yourself in this luxurious Legend home at Beacon Park. Classic Craftsman architecture lures you into this must-see marvel recently built in 2017. Thoughtfully designed with outdoor living and entertaining areas, it has a stunning California Room with stacking patio doors and a courtyard with BBQ & fountain. Professional upgrades abound with white Thermofoil cabinets and wood flooring throughout and upgraded carpet in the 5 bedrooms. Feel like a professional chef in the gourmet kitchen with large island, upgraded countertops with custom backsplashes, stainless steel appliances with built-in refrigerator, glass cabinets and walk-in pantry. Conveniently located on the first floor is one junior master suite. Retreat to the second story with a bonus room plus 4 stunning ensuites with spa-like bathrooms. The master bathroom is beautiful with white countertops and custom backsplash, floor-to-ceiling shower tile, aquatic spa and walk-in closet. Upgraded tile floors adorn all bathrooms and the laundry room. 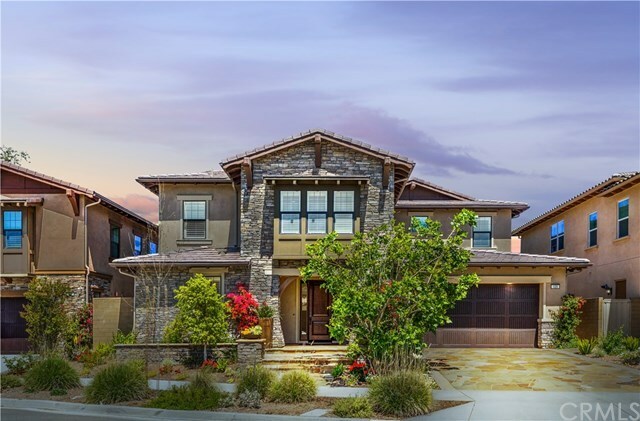 This home has it all from wifi-controlled thermostat and alarm, keyless garage entry, recessed lighting and soft water system. Be part of the award-winning Irvine Unified School District and indulge in Beacon Parkâs Great Park amenities: the five-acre Lawn, swimming pool, spa and lounge area, patio with outdoor kitchen, club house and sports complex. Enjoy easy access to I-5 and I-133. Live within 30 minutes of Laguna Beach and Newport Beach.